State run telecom giant, BSNL launched IVR based Aadhar linking facility for its mobile customers in all the circles. Now customers may link their mobile number with Aadhar number more conveniently even from home by dialing toll free IVR (Interactive Voice Response) number 14546 from their mobile number. The number 14546 is common to all mobile operators in India and the process of linking Aadhar number is very simple. 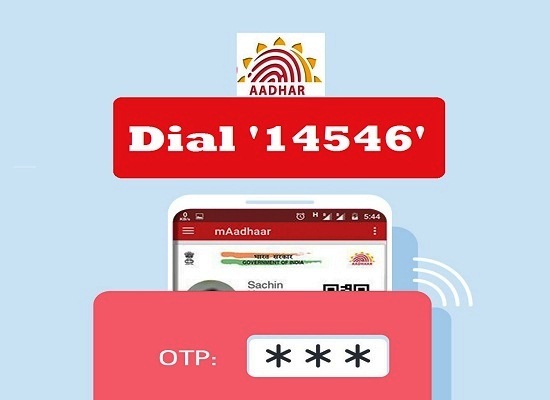 It means, customers of any operator (BSNL / Airtel / Vodafone / Idea / Jio etc) may dial the same number 14546 to link Aadhar with their mobile number. UIDAI (Aadhaar) has issued directives for generating OTP either through the service provider's website or through the Interactive Voice Response (IVR) services to facilitate the linking, also known as re-verification. Call 14546 from your mobile number. On being asked whether an Indian or an NRI, choose the respective option. Next, mobile subscribers will be required to provide their 12-digit Aadhaar number and press 1 to confirm. In case your Aadhaar input was incorrect, you get another option to provide the correct Aadhaar. An OTP will be generated and sent to your mobile . Next, IVR process will require your mobile number after which you will have to give consent to your mobile operator to pick your personal details like name, photo, and date of birth from their records. After giving consent, IVR will now read the last four digits of your mobile number to re-confirm your provided number. Once the process is completed, you get an SMS on your mobile number confirming that Re-verification was successful and it will take up to 48 hours to complete the linking. The new IVR service is likely to bring huge relief for mobile subscribers as it now makes it easier to link your Aadhaar number with mobile phone number without the need to visit customer service centers or retailer shops. Complying to the government's order, the Department of Telecommunication (DoT) has already issued instructions to all operators to verify all existing mobile subscribers (Prepaid and Postpaid) through Aadhaar based e-KYC process on or before 31-03-2018. Dear readers, please share your views and opinions about Aadhar linking through toll free number 14546 via comments with us.